For those who can book last minute book flights, drive through the night or fake illness nearer to the Alps then tomorrow could be an incredible day of mid-May glacier powder skiing on the Austrian glaciers. 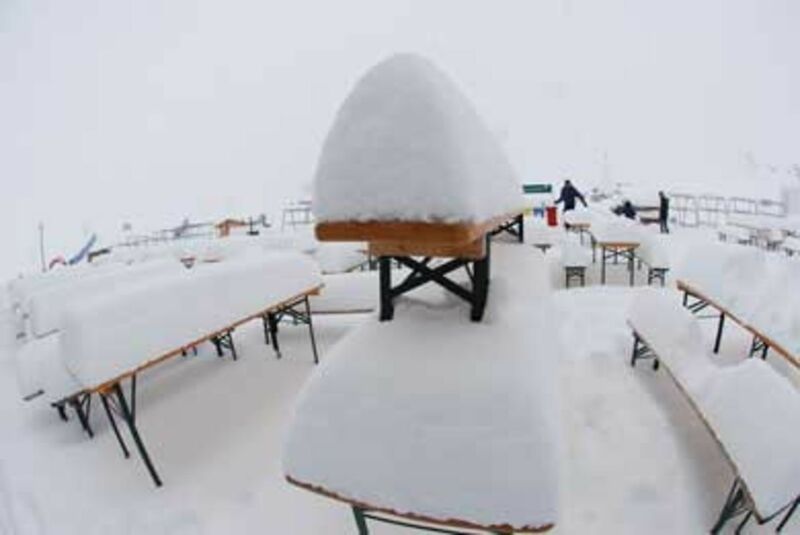 Overnight saw a cold front hit the Austrian Alps with heavy rain in the valleys and heavy snow from around 1700m up. All this meant the glaciers of Austria got a great deal of snow and the Stubai Glacier today had a whopping 40cm (minimum) of new snow. Continual snow fall through the evening and a forecast of snow showers and sunny breaks in cool temperatures for tomorrow suggests an incredible day awaits those lucky few who get on the snow tomorrow – I would guess at least half a metre of fresh snow. And there really will be just a few. I was at the Stubai Glacier today and there were possibly 100 cars in the car park, this being the weekend as well – tomorrow should see even fewer visitors. If the skies clear tomorrow then those lucky enough to be on the snow should get an immense day of powder skiing in an almost private ski domain. Not sure if I will be one of the lucky few, we will see….